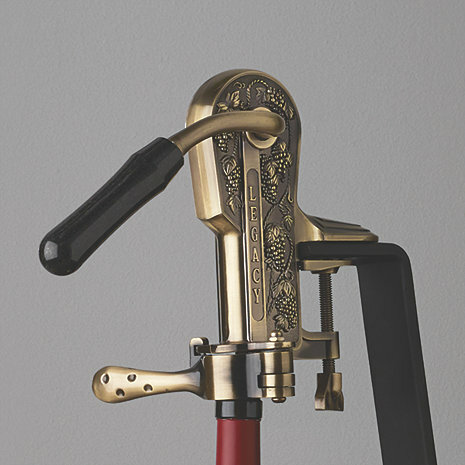 Our bestselling corkscrew is now available with a solid black marble handle. Enhancements to our regal replica of an antique corkscrew promise years of effort-free openings. A smooth-gliding, Non Stick coated worm removes corks (natural and synthetic) with a simple pull of the handle. Inner workings and grapevine-relief casing made of lasting zinc alloy. Antique Bronze finish. Can also mount to your bar or tabletop. Do you have parts to repair Legacy Corkscrew? 8 1/2" height is correct. Does the legacy black granite corkscrew and stand come in pewter as opposed to the antique bronze? BEST ANSWER: Yes! My kitchen is black, grey, and white and thus also wanted the pewter mechanism. Had to wait a couple of months for it to come off of back-order, but it was worth it! It is beautiful and highly functional!! Does this item come with the stand? It is not stated clearly in the description. BEST ANSWER: This Legacy Corkscrew with Black Marble Handle (Antique Bronze), item number 433 15 01 does not come with a stand. However, for an additional cost, item # 433 15 87 01 has the stand included. No the stand has to be ordered separately. A easy and classy way to open bottles of wine. And the cost is paid for by the bottles you can recork! It looks nice, but I find that the worm doesn't penetrate corks very well and I wind up having to use something else to get the cork out. I have other lever-devices that work much, much more easily. Good quality and seems to be better made than the old Rogar Estate screws. It's apparently made from heavier materials (it weighs more) which might be a factor. At any rate, it does the job well. This exceeded my expectations - very solid construction and smooth to operate. And it looks great on the bar! works really well and is a great addition to our bar area! It is not only a great piece of art but entertaining. I finally wore my first Lagacy Corkscrew out after 10 years of heavy use.Oh and I bought it used for $25 from a friend the had it for an additional number of years. With a bad wrist this is the easiest way way to get into all the loved wines in my cellar. Excellent opener, I like the reject mechanism. Plan on a screw replacement in a year or so though. Not difficult to change with a Phillips screwdriver and a little patience. Instructions are excellent! Liked it so much I'm ordering another for a gift!! This is my second one and works wonderfully. The handle is the only weak link on the whole set.